Design and build your own transducers. These full bridge strain gauges might be used to design transducers for beams that have a contraflexure point. Contraflexure is defined as a point in a structure where bending occurs in opposite directions. This may also be described as a reversed bending beam, or a double bending beam. The 4 grids are linear, all in the same direction. Look up the modulus of elasticity and the yield strength of your material, and design the spring element so that you will be working in the linear portion of the stress-strain curve. For best results use stainless steel or aluminum and match the strain gauge temperature characteristics. You may use these full bridge strain gauges for bending strain applications where only one side of the beam is available for strain gauge installation. These gages are easy to work with as the carrier piece has all 4 strain gauges for fast and easy installation. Having one carrier with multiple strain gages offers several advantages. Alignment of the 4 strain gauges with respect to each other is already done. Some of the strain gauges share common ribbon leads or Solder Padss which saves wiring steps and valuable time. The corners of the Wheatstone bridge at the signal output have been left open so that sensor performance can be tested and improved. Zero temperature compensation resistors and zero balance compensation resistors can be easily added into the open corners of the Wheatstone bridge circuit. An extra bondable terminal pad can be placed at the open corner so that the appropriate resistors can be wired in. Or you can simply connect your 4 leads (+Excitation, -Excitation, +Signal, -Signal) and jumper the signal leads together as needed to complete the Wheatstone bridge. Power up your transducer, and calibrate it with a known applied load. 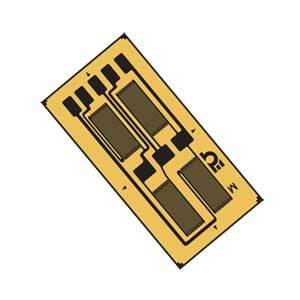 Nota: Supplied in Packs of 5 strain gauges.